Have you been to any Bank? You must have observed many activities there. Some may be depositing (putting in) money and others may be withdrawing (taking out money). Also, you must have heard people speaking about words interest, loan, Cheque, Demand Draft (DD). Have you heard people saying that interest they get is too low and it is difficult to meet household expenses? For them interest is an income used for daily living. You need money to start a business or to buy items. We can borrow money from people or organizations. Bank is one such institution which lends money to borrowers. The borrowers could be individuals, companies etc. Individuals need money to construct houses, to purchase houses, sites, items such as TV, Fridge, Motor Cycles, cars, etc,. . Farmers also need money for buying land, cattle, fertilizers, tractors and farm equipments. People need money to start business. Companies also require money to expand their business. Students also need loans for higher studies. Many others need money for marriages and for other social functions. Banks give money to all these types of borrowers. But can Banks give money free? Banks also have expenses (pay salary to their employees, pay rent for building, pay for electricity, pay for buying computers …,). Interest on loan is the extra charge that banks collect from borrowers to meet these expenses and make some profit. How do banks get money to give it to borrowers? They collect money from depositors who have some extra money (from their savings). Will these depositors give money to Bank free? The depositors also need some incentive (encouragement), so that they can give money to Banks. Thus, Bank is an organization that collects money from depositors and gives money to borrowers. To encourage depositors to give money, banks give ‘interest’ to depositors on the money they give to the Bank. Similarly, bank charges ‘interest’ from people who borrow money from the Bank. So we can say that the Bank acts as ‘middleman’ between those who have extra money (depositors) and those who need money (borrowers). Karnataka Bank, State Bank of Mysore (SBM), Syndicate Bank, Canara Bank, Citi Bank, HSBC Bank are some of the examples of Banks operating in India. Banks need a system with which they can record the transactions of their customers (depositing money and withdrawing money). For this reason, every individual or company needs to open an account in the Bank. At the time of opening account, Banks check the background of individuals by asking them to produce a few documents (Address proof, Date of birth proof….). When an account is opened, Bank gives a unique number to each depositor called ‘Account Number’. When an individual opens an account he is given a ‘Savings Bank Account’. When a company opens an account it is given a ‘Current Account’. When a businessman opens an account he is given a ‘Current Account’. 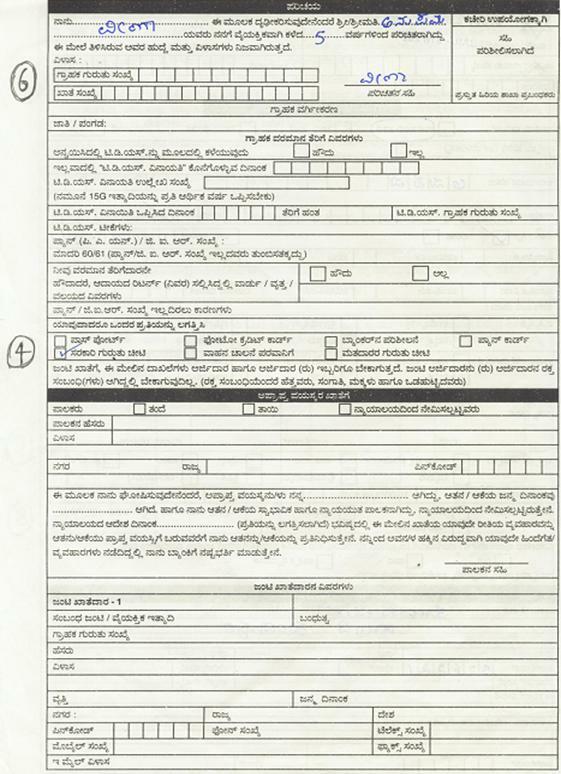 As an example let us look at how to fill an application to open an SB account in Karnataka Bank. The procedure and the application form used for opening accounts are more or less the same in all banks. The person opening an account needs to know a person called the introducer, who also should be known to the Bank. This introducer needs to certify that the account opener is known to him for a few years. This way the bank ensures that the person opening an account is a responsible person and is unlikely to cheat the bank. 2. Photos of the individuals opening the account. 4. 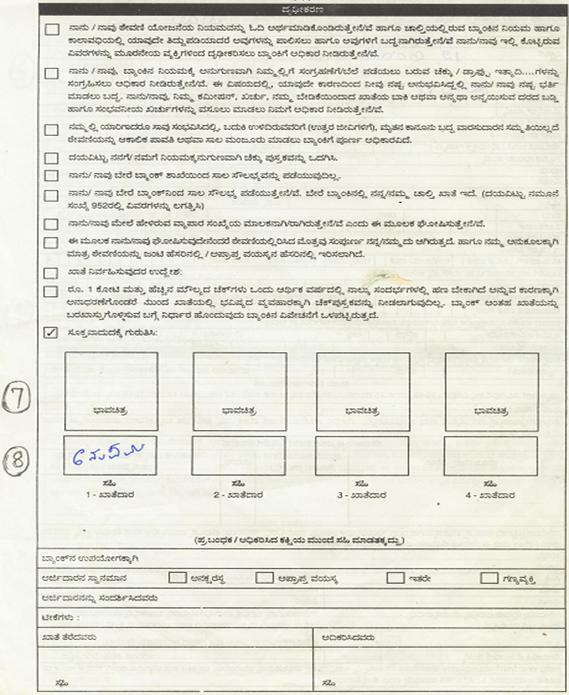 Copy of Voter ID card; ration Card, Driving License or pass port as proof of address. 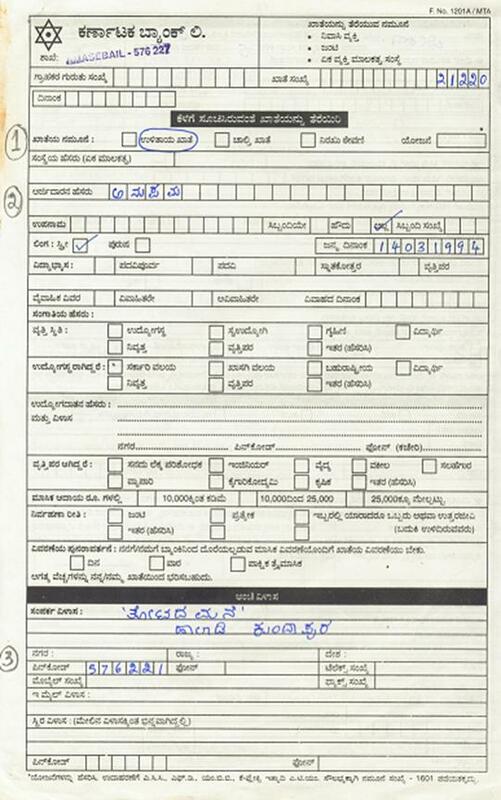 The front page of the application form looks similar to as given below. In the form, the photo of the individual who is opening the account needs to be affixed in the space provided. 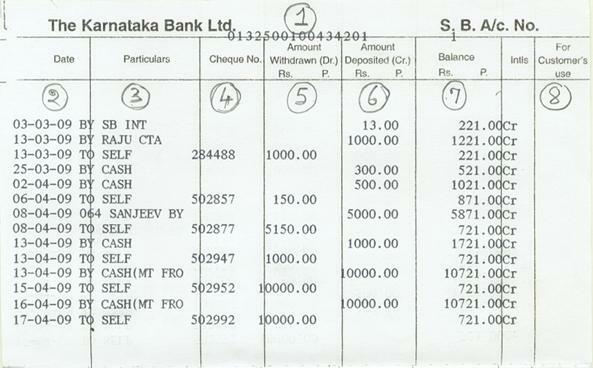 The2nd page of the Account opening form looks as given below. Name of the introducer and How many years since the account opener is known to the introducer. 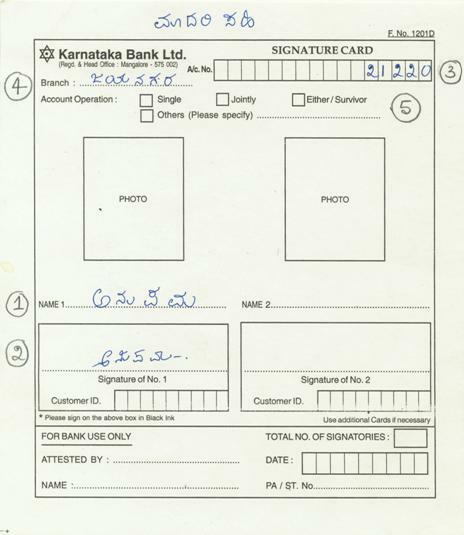 Bank maintains a Card which has two specimen (sample) signatures of the account holder. Normally banks scan the signature and store them in computer. Now an SB account can be opened by Anupama after making an initial deposit. Let us understand the details to be filled up on the Bank Copy. Most of the same information is filled up on the left side also. Note: Since authorization is not required for depositing money, any one can deposit to any one’s account. As an example let us see what needs to be filled, to withdraw money from the bank using the withdrawal form of Karnataka Bank. 2. This form can not be used to make payment to others. Since the withdrawal slip cannot be used to make payment to others, we use a form called cheque. Almost all the banks have similar formats for pass book. 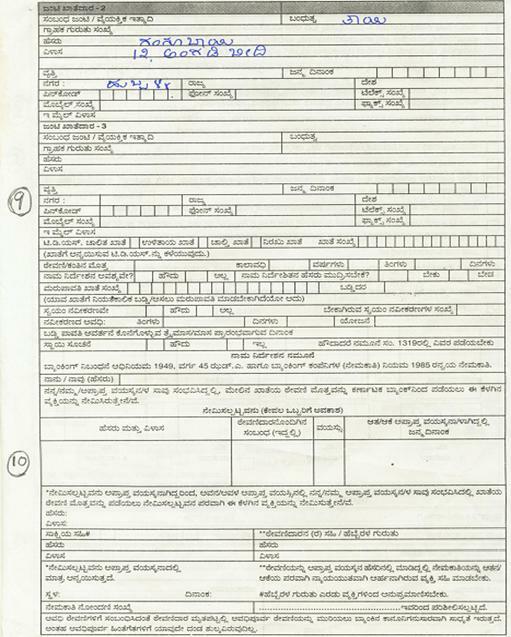 As an example, let us look at the pass book entry of an account holder of Karnataka Bank which is given below. The next and subsequent pages give the details of the transactions carried out by account holder. Let us assume that this account holder does following transactions. The date on which money was deposited or withdrawn. How the money has come in to the account or to whom money has been given, and how it was taken out. The internal number used by bank or the cheque number of the cheque. Amount withdrawn from the account. This reduces the money available in the account. Amount deposited in to the account. This increases the money available in the account. The balance amount in the account on a particular day. Account in the banks or Post offices can be opened in more than one name. ‘Joint account’ is an account opened by more than one person .A joint account can have a maximum of three names. While opening the account ,names of all the persons are to be mentioned. In such cases Specimen signature card needs to be filled up for all the joint account holders. The option chosen by the account holders need to be intimated to Banks as seen in the following application. We have seen earlier that money can be withdrawn using either a withdrawal slip or a cheque. Only the account holder can use a withdrawal slip to take money out of his account. To make payments to others, only cheques can be used. However,a cheque can also be used by an account holder to withdraw money for himself. Assume that your banker (where you have an account) is Karnataka Bank and Nanda’s banker is Canara Bank. 4. If the cheque is passed by Canara Bank then Canara Bank debits the account of Drawer (Your friend) for Rs 1000 and informs Karnataka bank that cheque is passed. The above process is called ‘Cheque clearance’. If Payee and Drawer have their accounts in the same city/town the amount is normally credited to the account of Payee in 2 or 3 days. In case of outstation cheque it may take several days. You would have heard the term ‘bouncing of cheque’ or ‘dishonoring of cheque’. It means that the receiver of the cheque can not be credited with the amount mentioned in the cheque to his bank account. 2. Signature/s on the cheque does/do not tally with what is given to the Bank in the specimen signature card. The Government of India has made a law to the effect that dishonoring of cheque is a criminal offence. In such cases the person issuing the cheque can be sent to jail. 2. ‘Crossed cheque’: In this case the words ‘A/C Payee’ are written across at the top left corner of the cheque. (As in circled number 9 in the format discussed earlier ). 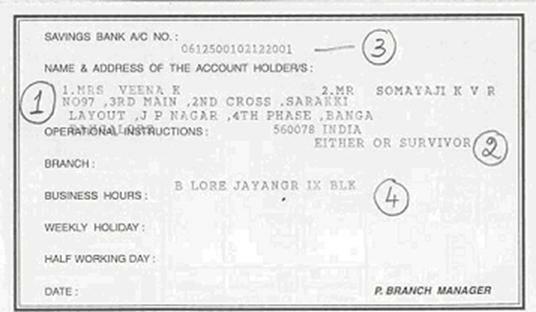 This type of cheque can be encashed only by the payee (whose name is written on the cheque) that too only after crediting the amount to the account of payee through his banker. Thus this type of cheques is more secure and even if the cheque is lost it is very difficult for the possessor of cheque to encash the cheque. The crediting of crossed cheques follows the process of ‘Cheque clearance’ described earlier. 2. The amount is paid only after crediting the amount to the account of the Payee. 3. Only the person (Payee) whose name is mentioned against ‘Pay’ in the cheque can receive the money. 4. Even if the cheque is misused by some one there should be a way to find who received the amount. If the cheque is of different bank/branch/city, amount is not given immediately. It is a special instrument which does not get dishonored (bounced). It is always issued by a Bank. 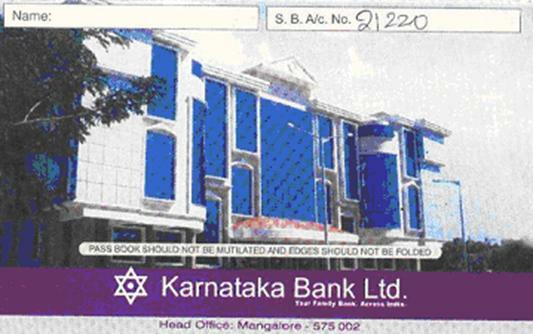 Given below is the copy of a DD issued by Karnataka Bank, as can been seen from the name printed at the top. Notice that this DD is a crossed DD as ‘A/C Payee’ is mentioned in the middle. The account needs to have enough balance, at the time of passing of cheque. Credit of amount to the payee’s account. Because of this reason DD does not bounce and hence it is as good as cash. For this reason, many organizations ask for payment by Demand Draft for their products and services (issue of application forms, payment of fees, buying of products.) and not cheques. Banks follow the procedure of cheque clearance for crediting DDs also, so as to avoid frauds in DDs. Most of the banks have computerized their operations which has reduced their paper work. Interest calculation, issue of Deposit receipts, clearance of cheques and many such routine activities are performed by computers. This has helped in increasing the efficiency of banks. This is a facility where money is transferred electronically from one account to another account without the need for issue of cheque, DD. In this method the amount is credited to payee’s account immediately eliminating the need for ‘cheque clearance’ thereby saving time. This method is used mainly by banks for inter bank transfer and by many companies. You must have seen people withdrawing money not from banks but from machines called ATMs (Automatic Teller Machines) from anywhere, any time. This facility has been made possible because of computerization in Banks and interlinking of branches of Banks (Connectivity). Money received/to be paid needs to be converted to local currencies. Some of the popular currencies and exchange rate as on October 12, 2006 is given below. 4.4 Problem 1 : If an Indian company wants to import goods worth 1000 Dollars from the USA, find out the amount(number of Rupees) the company needs to give to the Bank to get the same amount in dollars? Since the supplier accepts only Dollars, the company pays Rs 45,700 to the bank to get the equivalent amount in dollars. 4.4 Problem 2 : If an Indian company exports goods worth Rs1,00,000 to a Japanese company. Find out how many yen it has to mention in the bill given to the Japanese company. This is the amount in yen which company has to mention in the bill. Various forms(instruments) used by banks in respect of operation of an account in a Bank.